A pub, a church and a war memorial. The constant three. As I drove through the smallest hamlet or village in the UK, I was greeted by this triumvirate of society. One is dedicated to the enjoyment of company. To celebrate the passing of the day, to quench thirsts. Its importance undiminished. For we are a social animal. One is for introspection. To celebrate the bounty of life and the preparation for what may come. Its importance is waning. For we are increasingly secular. One is to remember. Dedicated to the millions, listed and unlisted who sacrificed their youth, their blood, their lives. Its importance growing. For we are their legacy. If we do not look to them as we pass, they will fall again and the light that they flung to us will not be held safe by our hands, but will drop into the darkness. They will become distant relics of distant times, but we should have no excuse. These are not the combatants of eons past, unnamed, unknown, unseen. We hold photos of them, we know their names, we know their lives. And their deaths. So we must hold the light safe and pass it to our youngest generation that they may remember in a hundred years and more. To those that say this glorifies war, I say, you are free to hold that opinion, for it was bought with the blood of millions. Hold your beliefs, express your opinion for it is a reflection of their sacrifice for you. But, do not stand in the way of the majority that think differently. Rather, stand to the side and say thank you and be silent for two minutes. It is a mere 120 of the yearly 31,536,000 seconds that you have been gifted by them. The least you can do is to acknowledge your debt of freedom. 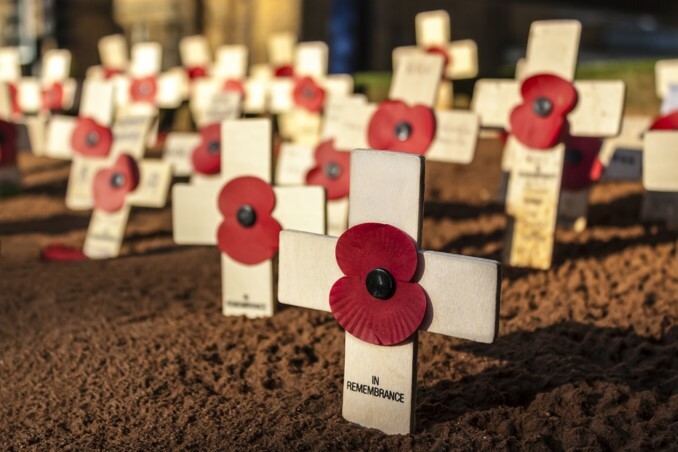 To those that would take the symbol of remembrance and use it to divide, you are deluded. The poppies of Flanders grew from the blood of black, white, brown and yellow skins. The blood of Christian, Jew, Muslim, Sikh, and others. The believer and nonbeliever. The Empire’s finest from Ireland to India, from Canada to New Zealand. They fought and died, united against a cause that you most resemble. Every year that we remember them is another year you will never come to power. Yesterday, I drove through a country area in Western Australia. A small Church, nestled under wattle trees. A roadhouse that had a relic of a sign showing it once was a pub. Two houses and a few farms high on the surrounding hills. The area home to a few scattered thousand. In 1914 the same land would have been home to a few hundred. And a white obelisk. Standing gleaming in a triangle of tended lawn, host to twenty-six names. Three sets of brothers. Nine were under twenty-one. One was fifty. All left a gap in the lives of others. The disappeared society, no more to drink and socialise in the pub. No more to pray for their souls and sing the hymns of their youth. All engraved forever on standing stones.